The Opera Gallery New York along the Big Apple's Madison Avenue has developed a leading voice for the contemporary art community. 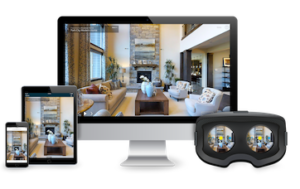 With Immersive 3D Media, more people can experience any real-world place, from anywhere. digitally in Immersive 3D Media. ShowcasePros’ captures your place by scanning your location. We learn about the features and uniquenesses. We can capture 3,000 to 5,00 square feet per hour. Some locations will require more than one day of scanning. We have years of experience and we use best practices to give you the best results. Once it has been collected we upload for processing. Once processed, we provide a preliminary view, allowing our customers to see the results early. Don’t worry, it will be stunning. Our equipment handles lighting and create HQ photos. We will then work with you on discover features that you would like highlighted in your tour. Provide us any URL’s to access media and other online content. These will appear in your tour as Tags and Highlights. Share with ease. you can share your tour using social media or traditional methods. Your tour is available on any connected device with a browser. Visitors explore through their web browser — no additional apps or downloads necessary. Your tour can be embedded on on your website or other marketing portals. We can also publish your tour to Google Street View, Google Maps, and Google My Business page. We can help you with any of your marketing goals and special requests. We aim to please and never disappoint.